Stephen of Ballinrostig speaking to visitor Sue at the Airport Hotel. Cheese makers may often live in isolated places but not in isolation. And it is no surprise to hear Siobhán Ní Ghairbhith of St Tola enthusiastically speak of the Burren and Cliffs of Moher UNESCO Geopark during the Cork Cheese Week at the Airport Hotel. The natural treasures of County Clare (and indeed of any county) must be managed in a sustainable way, as must the local farms. Siobhán is one of the people supporting this drive to preserve the unique landscape to help develop thriving communities. If the landscape is damaged so too is our future, whether we are farmers or consumers. Might be a bit late this year (though you’d never know!) 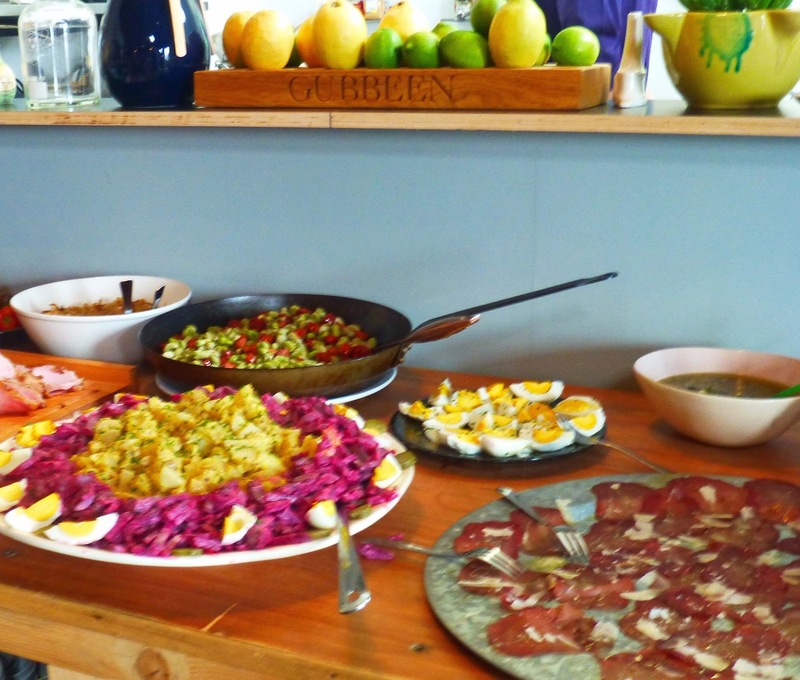 but I’ll certainly be heading to Clare next year to explore the park and also the Burren Food Trail. Hadn’t met Siobhán for a few years (aside from Twitter of course!) 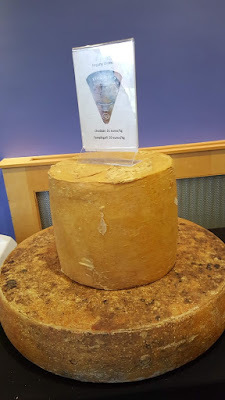 but did stay very much in touch with her St Tola Irish Goat Cheese, a magnificent cheese (especially the ash log version). The St Tola motto is “better, not bigger.” And it is better. Try it for yourself; stockists listed here. Coolea Cheese is nowadays made by Dicky Willems junior. 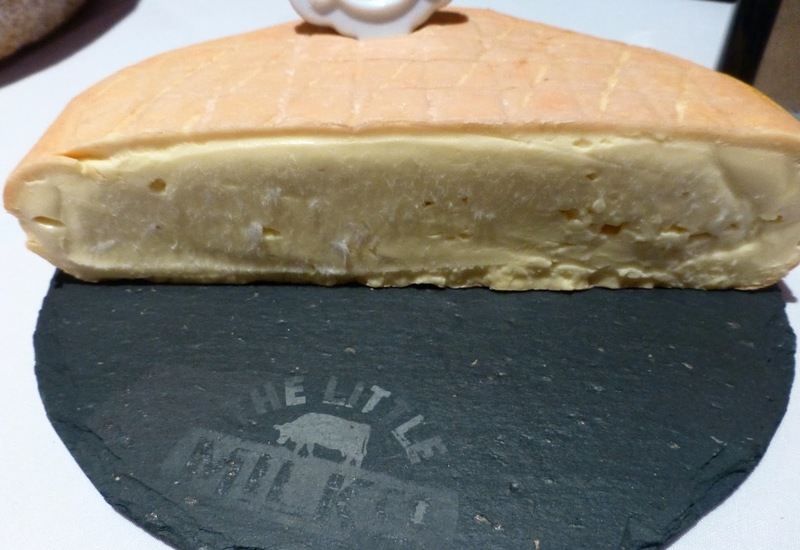 Nothing but healthy fresh cows milk is used to produce this internationally highly acclaimed cheese on a mountain farm in Coolea, West Cork. One cheese but sold at different ages, from a mild and creamy 3 to 6 months version to the deep intensely flavoured Extra Matured (18 months). “You can’t improve on perfection,” said Dicky’s sister Lenneka when I met her at the Airport Hotel. No arguing with that! 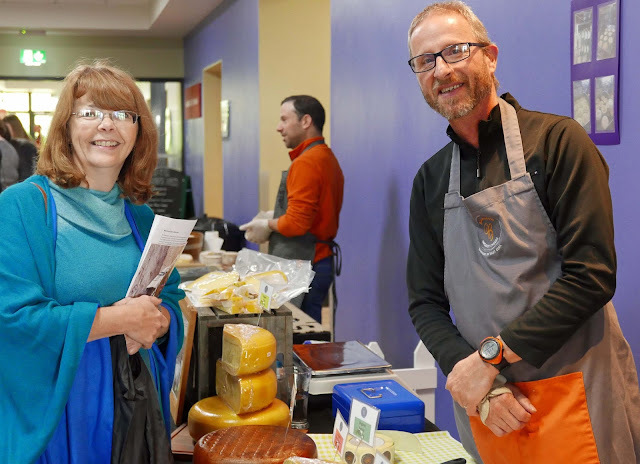 Ballinrostig Cheese is owned and run by husband and wife team, Stephen Bender and Michele Cashman, since 2014. This year they converted their entire range to organic. Their basic product is a Gouda style cheese. The signature cheese is the Ballinrostig Organic Gold, mainly made from Jersey Milk, and it’s a beauty! The Gouda style herb cheese range includes Nettle, Cumin and Red Pepper and Garlic. 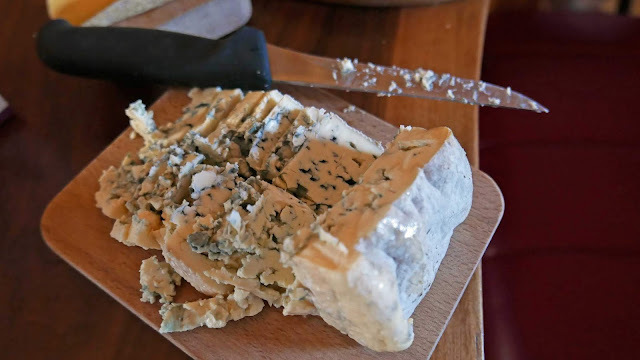 In addition they produce an Organic Cream Cheese with Nettle and Garlic, and a Halloumi and a Bán (Feta) cheese. 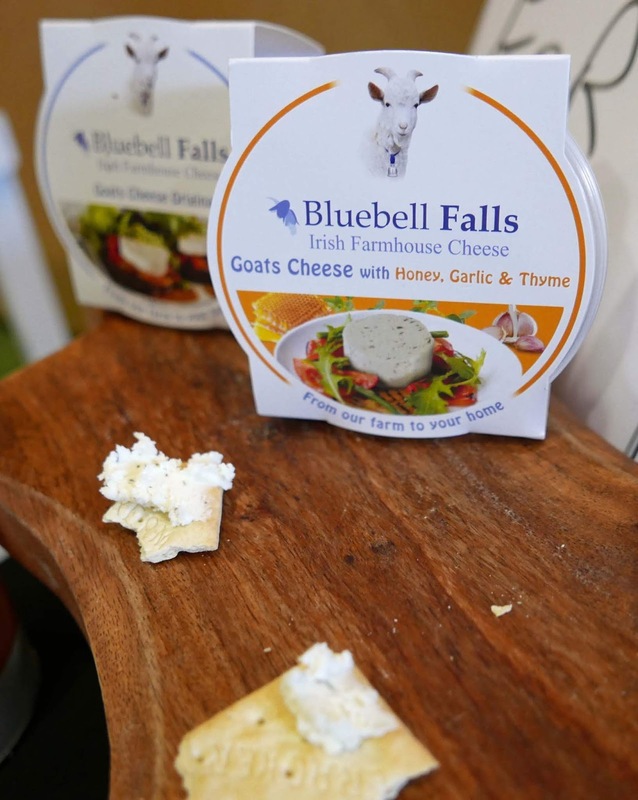 Widely available are the goats cheeses being produced by Bluebell Falls from Newtownshandrum in North Cork. 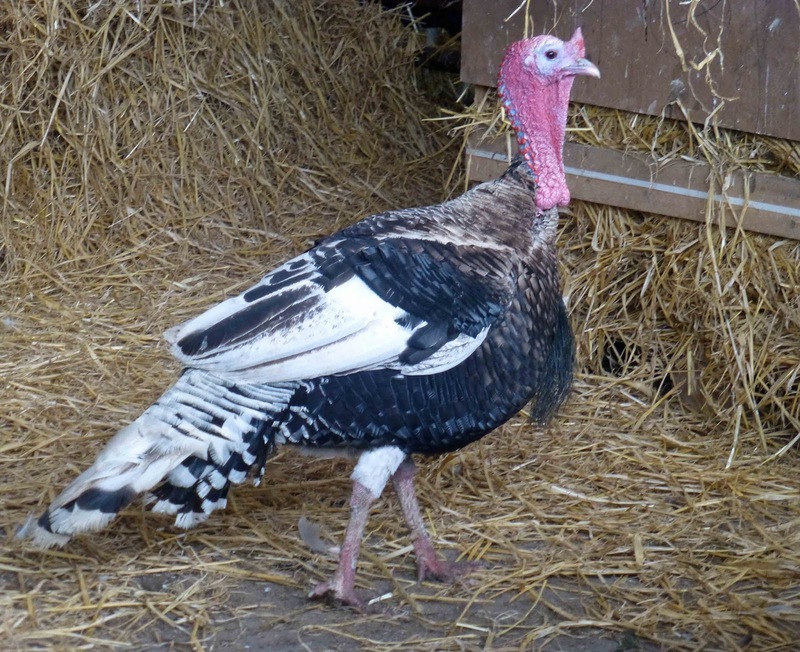 Outlets include SuperValu, Tesco and On The Pigs Back. I asked Victor how the change to tubs (from their earlier “tubes”) was going. “Very well indeed,” he said. “The tubs are more convenient, easier to open and easy to reseal.” And the quality is as good as ever! 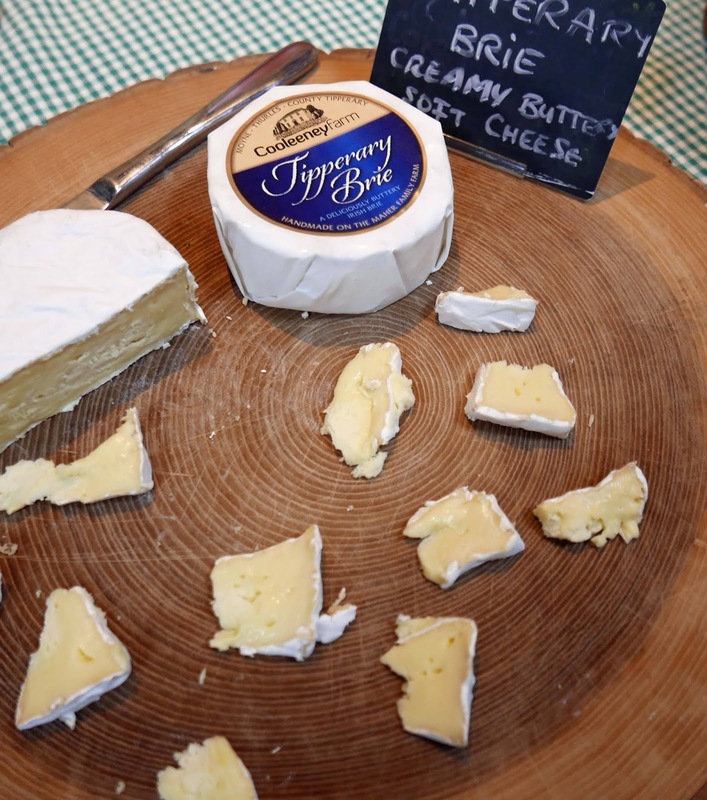 Tipperary’s Cooleeney are well established and have been making cheese for 30 years. Catriona told me that they make no less than 13 varieties “mainly brie and camembert and a few hard ones also”. 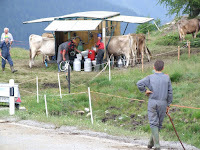 The milk comes from their own cows while the goats milk comes from local farmers. 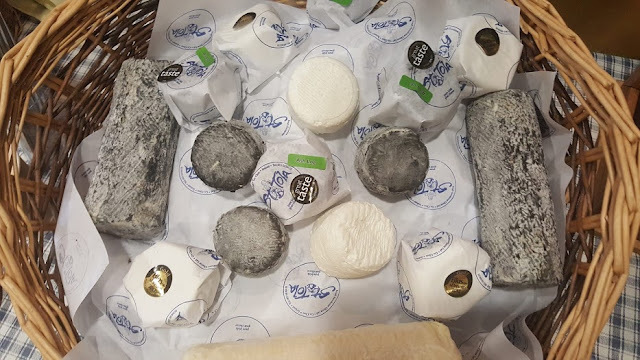 Enjoyed tasting their Gortnamona Brie style soft goats cheese and also their delicious Tipperary Brie, mild, creamy and buttery, the milk from their own cows. I also met Rob, representing Knockalara Sheep’s Cheese from County Waterford. The cheese, mild and soft, is made by his in-laws Agnes and Wolfgang Schliebitz in West Waterford, and was the centre-point of a delightfully delicious dish with pistachio, baby artichoke and roasted red pepper during a recent visit to the up and coming Waterford city restaurant Everett’s. They also do a mature version. 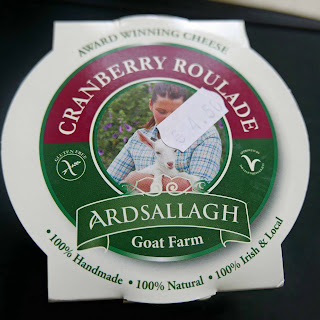 Their cheeses - they also do a goats cheese - are available at local markets: Waterford City Market (Saturday); Dungarvan Farmers Market (Thursday); and Ardmore Market (Sundays in summer). Heard they made quite a match at the cheese show finding a perfect pairing with Melanie Harty’s Apple and Sage Jelly with chilli! I did a few turns around the various stalls at the Airport Hotel but missed out on at least two. One was Coolatin, hand-crafted by Tim Burgess from his own pasture fed cows in West Wicklow for the past 20 years with a motto for their Mature Raw Milk Cheddar that reads: Pasture to Cheddar The Same Day. Quality is enhanced by processing only in the summer months when the cows are grazing fresh clover-rich pastures. 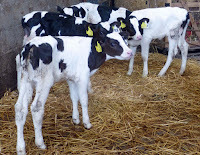 Besides, they use early morning milk, high in melatonin which aids sleep and relaxation and there is no storage or pasteurisation with the milk going direct to the cheese-vat. The Carlow Farmhouse stand was also busy each time I called. 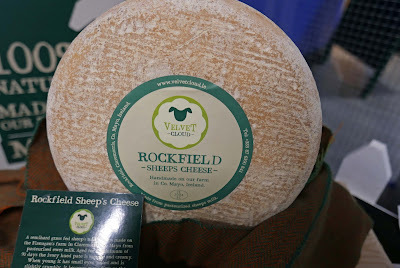 They make an award winning Sheep Cheese, a hard cheese, which may be matured for up to two years. They also produce a Goats Tomme and a Cow Cheese (sometimes flavoured with herbs and spices). Part One featured mostly the new cheeses and you may read it here. Eoin (right) starts the tour. 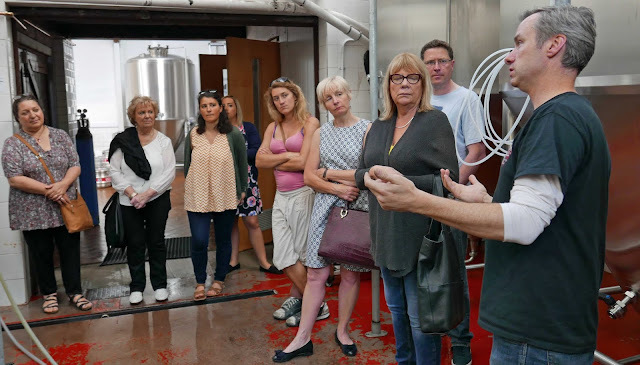 The sun shone as members (and guests) of the Munster Wine & Dine gathered at the Cotton Ball for a leisurely tour of and tasting at the pub’s own micro-brewery. The brewery was founded by the Lynch family less than five years ago yet they’ve outgrown the original brewery and have moved into a new one in their Mayfield (Cork) premises. The old brewery is being wound down, our guide Eoin Lynch told us, but is still being used for some brews, including their Lynch’s Stout. He is delighted with the “huge difference in space” afforded them by the new facility. They also have their own mill, the grain coming from Togher. 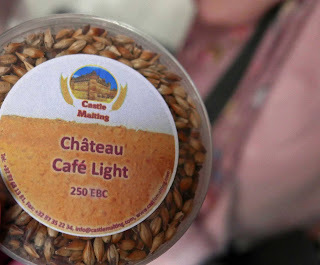 Speciality malts are imported, mainly from Europe, and we had some fun smelling the many aromas. They have almost tripled batch size with the new facility. “But we still need to balance demand, not to get too far ahead. You don’t want product sitting around.” And he confirmed, in response to a question, that draught does indeed taste better. One of the reasons is that most bottles are filtered for “shelf life purposes”. He showed us some of their kit, including the bottling line, capable of doing 1,000 bottles an hour. 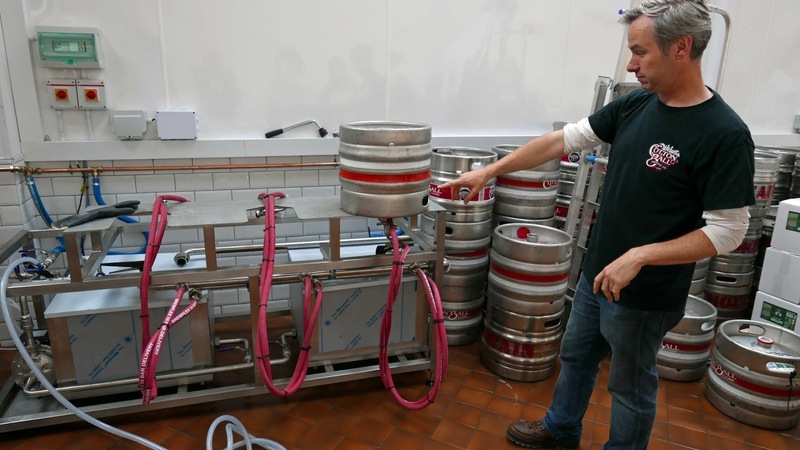 A new keg wash means they put through three kegs at a time instead of one previously. Now it was time to sit down in the Brewery Room, pay tribute to the bar founder, one Humphrey Lynch, Eoin’s great-grandfather, who left Ballyvourney at 15 years of age and settled in an American town known as Byefield which he later used in naming his Cork estate house. After working for two years with Joseph Longfellow, cousin to the famous poet, he worked for a year in the ship yard at Newburyport until the American civil war broke out. He was one of the first to enlist in the 4th U.S regiment light artillery battery and served through 27 general engagements principally in the army of the southwest and along the Mississippi valley. Then he worked for 14 years as a foreman of the picker room in Newburyport cotton mill. This would later give him the name of a public house he purchased in Baile na mBocht (now Mayfield) after returning to Ireland in 1870’s. Nowadays, each bottle from the new brewery pays tribute to the man who made it all possible, bearing an image of American Civil War veteran Humphrey on the label. We were on the draught though, five beers in all. And Isabelle Sheridan of On the Pig’s Back supplied the cheeses for the pairings. Generally, it seemed the stronger the beer, the stronger the cheese. For instance, the lager and the easy drinking Indian Summer paired well with the Ardsallagh Feta, the Ale with Hegarty’s Cheddar, the Indian Pale Ale (with the Magnum hops, a favourite bittering hops here) with both the Cheddar and the Bleu D’Auvergne. The stout too matched up well with both the cheddar and the bleu. And Hegarty’s new comté style cheese called Teampallgeal was very popular across the board! 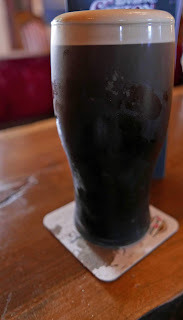 After that generous tasting, there was a pint “of your choice” for each guest and lots of chat as the evening wound down and I relaxed with a flavoursome pint of Lynch’s excellent stout. Until the next time, which will be a mid-summer trip to the county on July 8th. Members are asked to keep an eye on their emails for details. Later in the year, we will be visiting The Mews in Baltimore and Longueville House in Mallow. The Cotton Ball website is here. The Gubbeen stall at the Thursday Mahon Point Farmers Market is always worth a call. Recently, we got a wheel of their delicious cheese, an Irish classic. 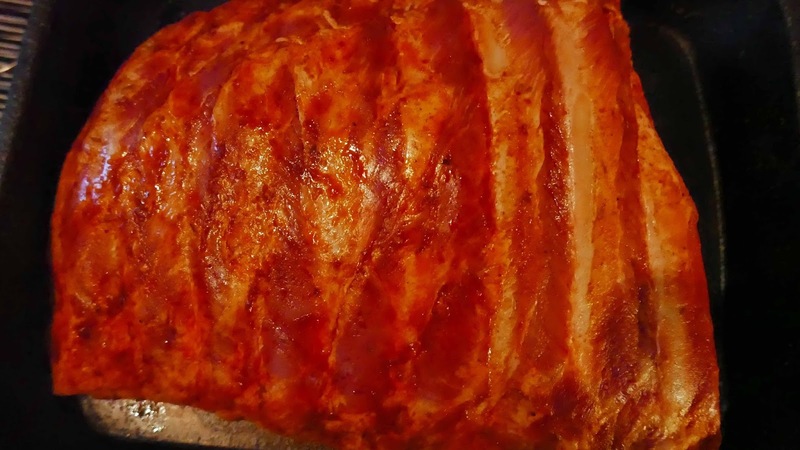 Fingal Ferguson’s smokehouse and charcuterie in general is always there in abundance and we spotted these ribs there, now our Taste of the Week. We got enough for three, maybe four, for a tenner. 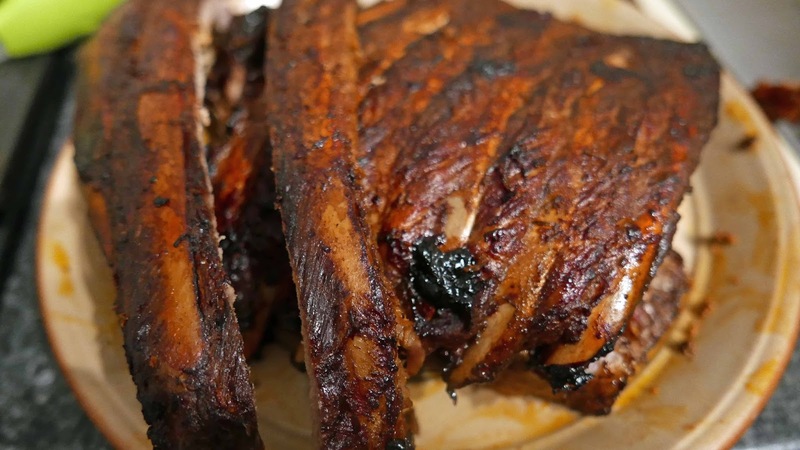 And advice on how to cook them: low and slow, with a tray of water underneath to keep them moist during the process. 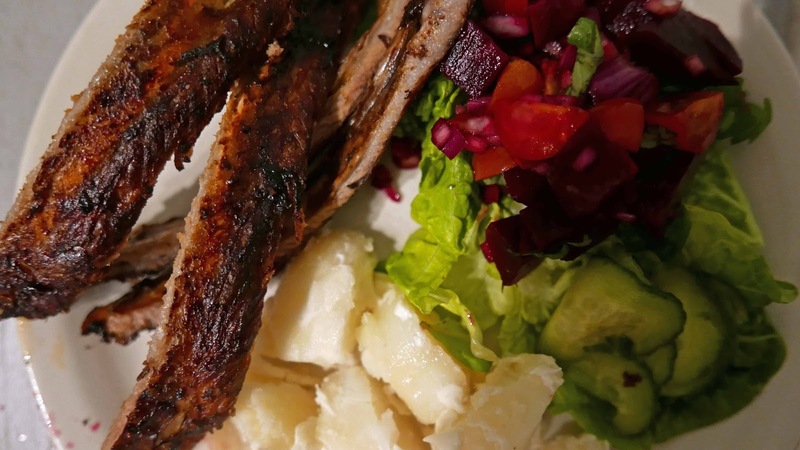 The Blog Chef followed the instructions, added a simple salad, and it proved to be a delicious flavoursome main course. Thank you Fingal and company! 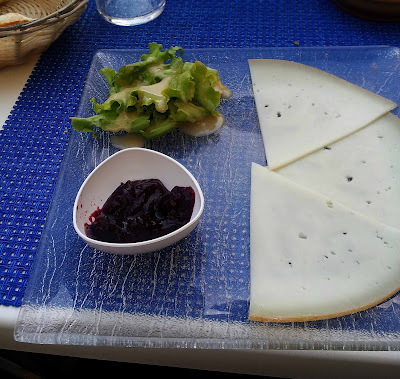 And, of course, we had some of the cheese later on. 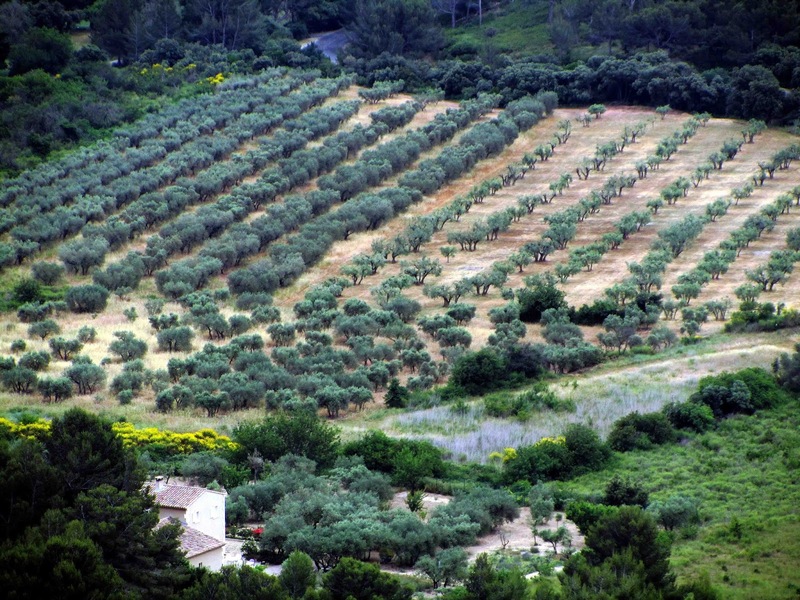 Olives beyond Tuscany. Mozzarella beyond Italy. 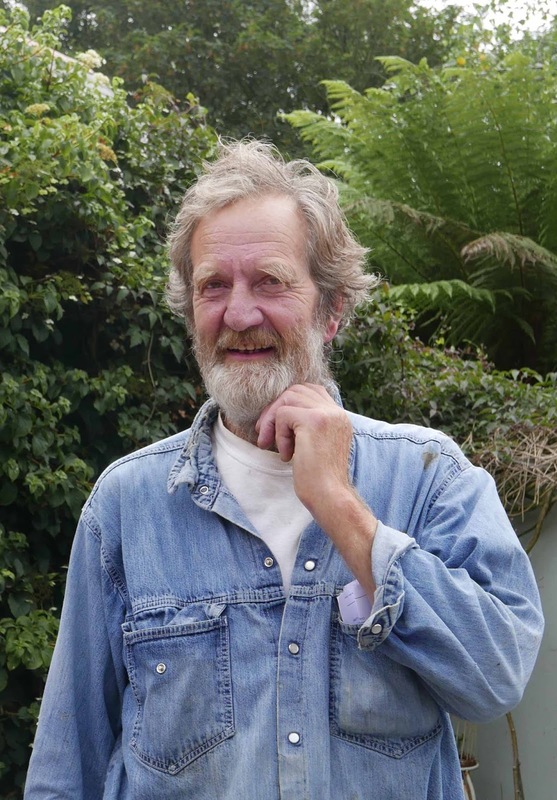 Toby Simmonds Tells Two Stories. Toby Simmonds, telling us about The Real Olive Company and Toons Bridge Dairy, was the star of the show as the Munster Wine & Dine Circle launched it's 2018 programme at a packed L’Atitude last Thursday. The gathering may have been expecting a genteel tasting of his imported olives and his Toonsbridge Irish cheese; well they got that, and much more, with Toby pointing out the snobbishness surrounding olive oil, the very limited varieties available in the supermarkets (like Chardonnay and Cabernet Sauvignon in wine and not too much else), the overuse of caustic soda (the Spanish Cure) in olives. And his cheese story is just as interesting. Toby came into a challenging scene when, with the aid of a three figure loan, he started off here in 1993. 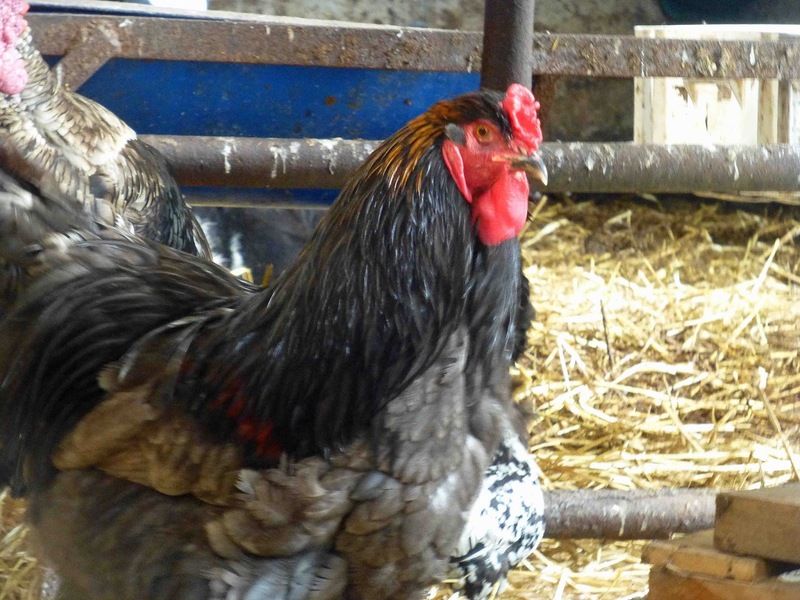 But since then farmers markets have taken off in a big way, the English Market stall has been and is a huge success for him and partner Jenny Rose Clark (Jenny Rose also runs the Sandwich Stall in the market). The snobbery comes across often at a market. “Is those olives from Tuscany?” When the answer is no, the potential customer walks away. Toby sees this as “missing the point” and something of an insult to all those communities around the Mediterranean who take their olives seriously and produce “good stuff”. 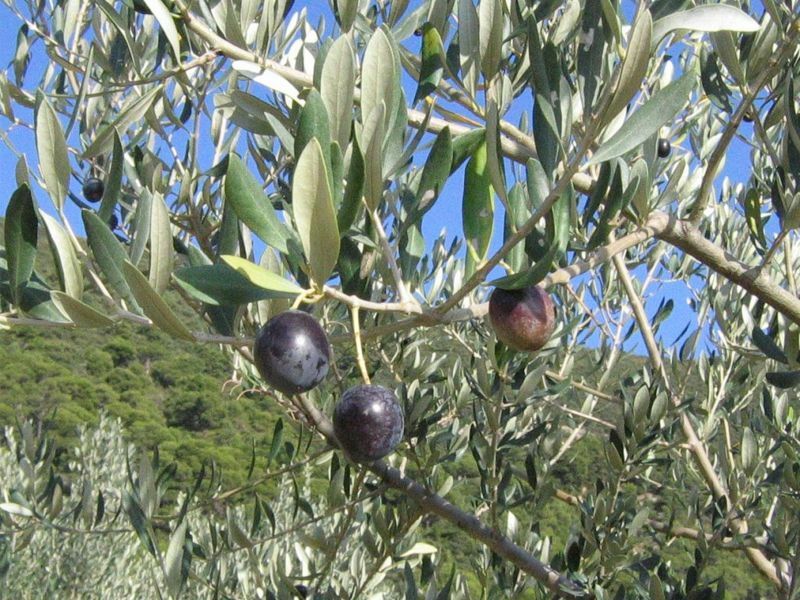 So then we got down to the business of tasting a string of his olives, starting with the Kalamata from the centre of Greece. 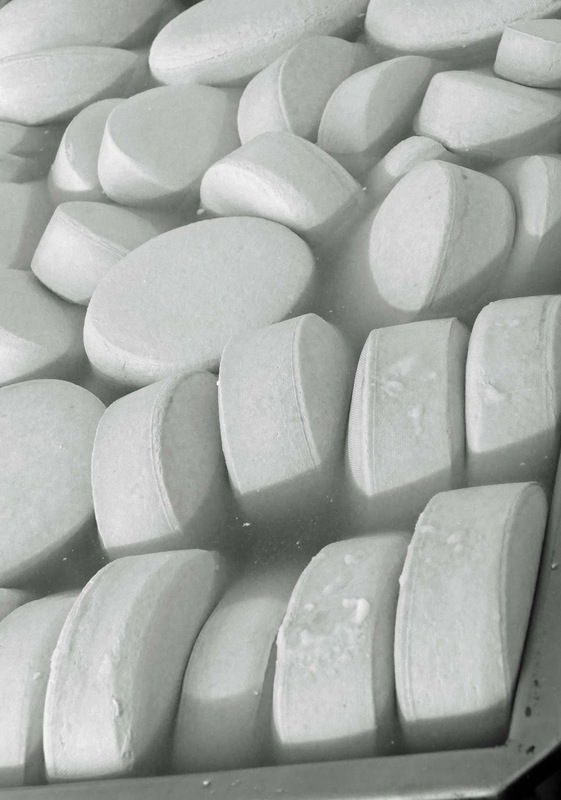 As we moved on, he mentioned the overuse of caustic side in curing. “A little bit is fine. But too much takes the goodness out of the olives. It is happening all the time.” The green Picholine olives from France, though now grown all over the world, have a “little bit of caustic soda” in their cure, were among the samples we tasted. Others in the tasting were the Galega (my favourite on the night) from Portugal’s Alentejo, the very expensive Nyons variety from Provence, the dry and wrinkly Beldi (“will be even better in three years time”), and the little baby olives which Toby finds hard to sell outside of Cork where it is a firm favourite, not least with the kids. Then we were on to the amazing Toons Bridge cheese story, a story that saw them “in crisis” just a few years after the original Buffalo/Mozzarella partnership ended in “divorce”. 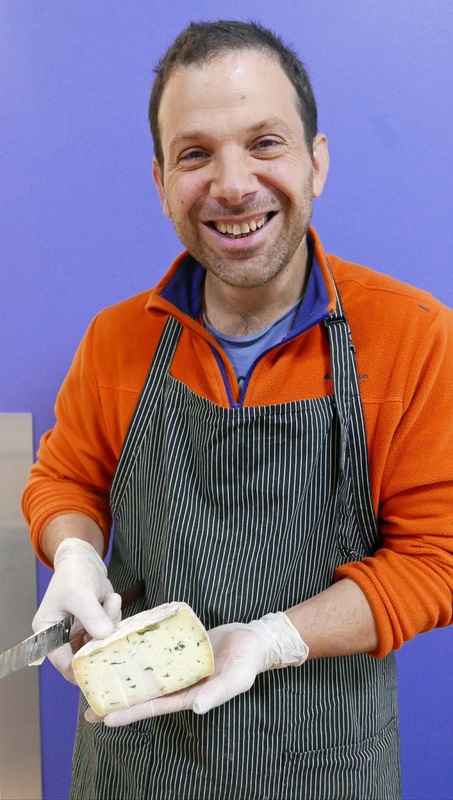 Flying in frozen buffalo milk from Italy wasn't a success but new cheesemaker Franco then turned up with a local solution and made it from cows milk. 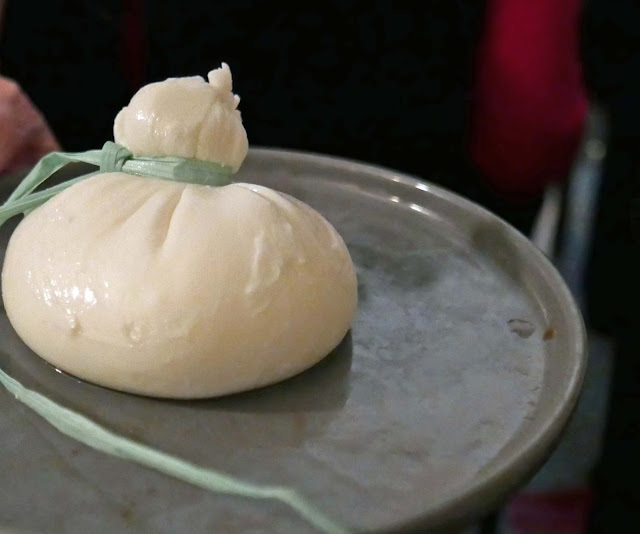 A key factor in Mozzarella is the whey starter (“a bit like sourdough”); yesterday's whey is used as a starter the very next day.” The starter is essential for texture and flavour and the Mozzarella is the same as you get from Italy. So the Toons Bridge cheese story goes on and the good news is that they now have their own little herd of 22 young buffalo with another twenty on the way - you'll have to wait a while for this herd's cheese though. Currently, Mozzarella (from cows milk) is delivered fresh to their English Market stall on Wednesday and Friday mornings. Eat it at home as soon as you can, maybe even eat it on the bus on the way home! It is not meant to be kept! The challenge presented by that crisis though has turned into an opportunity. With no fresh buffalo milk available to them anymore, Toons Bridge have creatively filled the gap by adding a string of gorgeous Italian style cheeses to their range. They also do Halloumi and Ricotta (try with Highbank Orchard Syrup). And then there’s the Pecorino Vincenzo. Pecorino is the general name for sheep’s cheese in Italy. This pecorino is made in Toons Bridge by Vincenzo to a family recipe from his native Marche region. Vincenzo has a small flock of sheep and he make this gorgeous Pecorino right here. Another must try from this rural hub of creativity, imagination and passion and, every now and then, a little bit of well deserved luck! 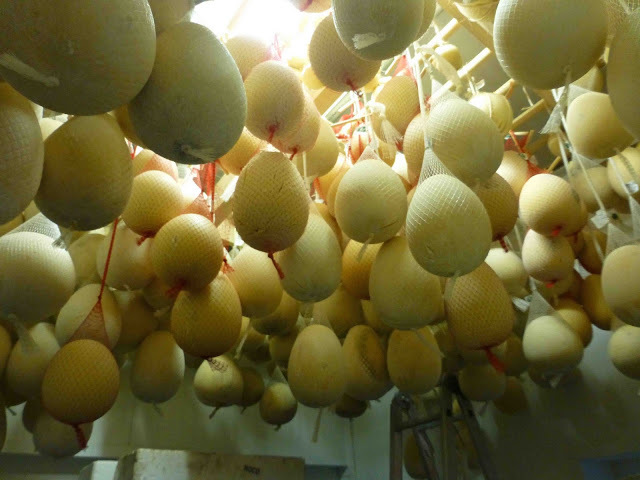 Another of their cheeses is Scamorza which is a simple stretched curd cheese that is hung (you can see the mark of the string) for a short period of time to air dry. It is similar to mozzarella and melts well. It is sweet and delicate. They do both smoked and unsmoked versions and I must say I enjoy the smoked one (great when stuffing those big flat mushrooms) or, as Toby suggested at the tasting, “..it is great in a sandwich, like hanging out with gypsies”. The enthusiasm is amazing. They are a long ways from finished here. More cheeses on the horizon. Keep a look out in the near future for the Toons Bridge Cardoon Cheese, featuring a flowering vegetable used in cheeses in Spain and Portugal. From the Med to Macroom, the links keep growing. So big thanks to Toby for his amazing talk. Thanks to Andrew O’Dwyer of Market Place for supplying the Prosecco and to L’Atitude for the canapés. Munster Wine & Dine Chair Eithne Barry filled us in on what is in store for the year. 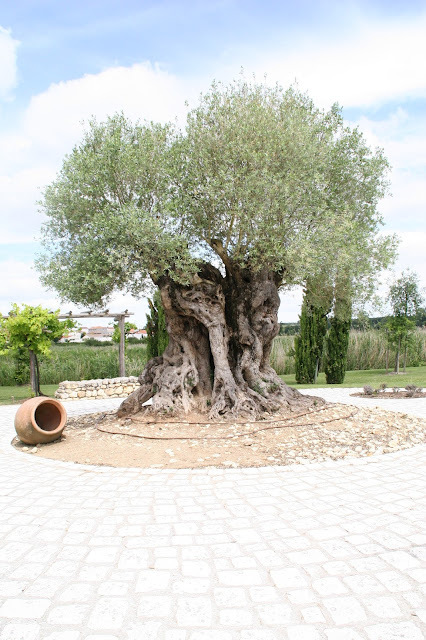 First event, on March 24th, is a Wine Trail (led by Colm McCan and with tastings!) around the historic streets of Cork, stopping at various places associated with wine, including the old bond. 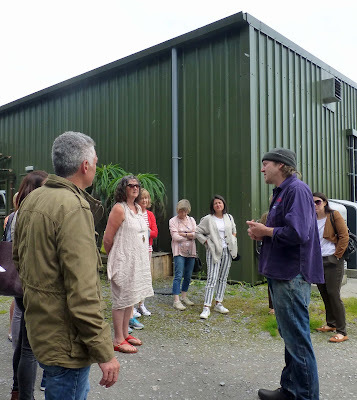 There will be some long distance tours during the summer, nearby producers too to visit, before the finalé, a tour and Sunday lunch in Longueville House, an incredible experience when we visited three years back. Lots to look forward to in the months head. So do join up (application form here) and enjoy. 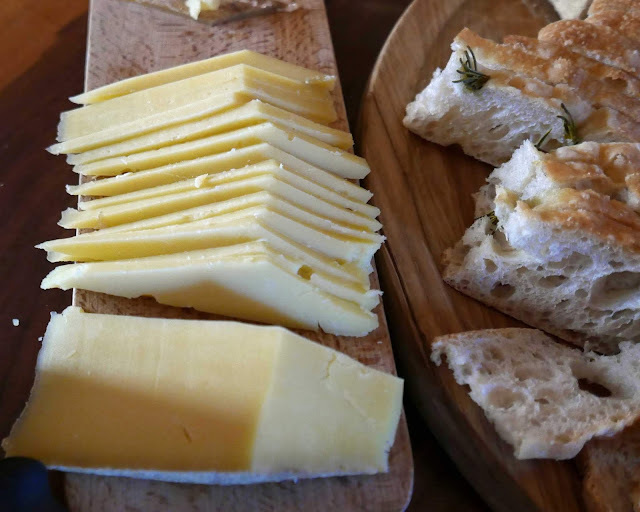 During the recent FEAST in East Cork, I enjoyed a multi-course dinner at Sage and one of the highlights of the evening was the delicious mature cheese from nearby Bó Rua Farm, so much so that people, pretty full after the amazing meal, were taking some home with them. This is our current Taste of the Week. The Dineens, Norma and Tom, have been making cheese from the milk of their Montbéliarde cows for just a couple of years. I was impressed with their early efforts at the Cork/Kerry Food Forum in 2015 but didn't know about this gem until Sage. On this blog, you’ll often read of winemakers saying healthy fruit is a prerequisite for good wine. And the Dineens say the “cheese begins long before milk reaches the cheese vat with the careful breeding of our cows”. In 2015, they were honoured to receive an AHI ‘Milking For Quality Award’. And you can expect a certain consistency from year to year as this is a “closed herd” meaning that all of the herd is born and bred on Bó Rua Farm, with cow families remaining for generations. Quality in, quality out. So do look out for the cheese from the red cow farm in Ballynoe! The Fergusons. And the Gubbeen Bug. Farming at Gubbeen is a family affair with father and mother Tom and Gianna Ferguson and their son Fingal and daughter Clovisse the key figures. 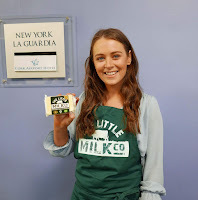 “Our cheese story begins out on the land.” She praised Tom’s herd, mostly Friesian, a few other breeds too including a few Jerseys "for their cream!" The cheese took off well and since then “everything seems to have dovetailed together”. Here, she was talking about the smokehouse charcuterie (and smoked cheese of course) by Fingal along with the gardening skills of Clovisse, not that either are confined to just one skill, far from it. 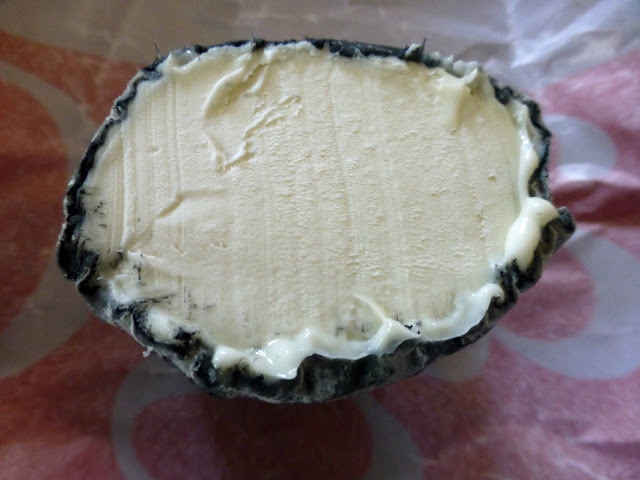 Gubbeen basically make one cheese type but you may buy it young or more mature or smoked and in different sizes. 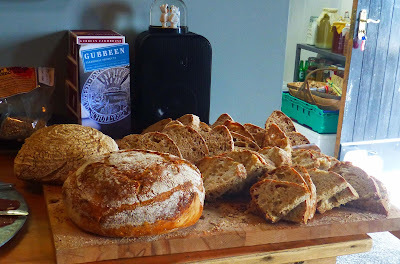 Read all about the variations here on the Gubbeen cheese page . Like his mother, Fingal too pointed “to the care of the land” as key. “Milk is vital to cheese. The quality of pig is vital to us. We have embraced with locals via the Piggy Coop. 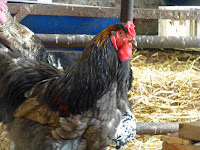 We stress the husbandry and the breed, mostly outdoor reared. You pay more but it is worth it.” By the way, there are 25 employed (including family members) in Gubbeen. Fingal spoke of salting and brining. “The brine is traditional Irish, herbs jazz it up.” He uses natural casings, “more expensive but a better result”. “These smoked products are not overly sterilised but good for your gut and more interesting in terms of flavour.” Read all about the smoke house, including the fabulous salamis and chorizos here. Then he took us on a walk around the yard and here we met some baby animals, including calves and bonhams, also a big turkey and a mighty cockerel that almost matched him. Then it was the turn of Clovisse to feed us. 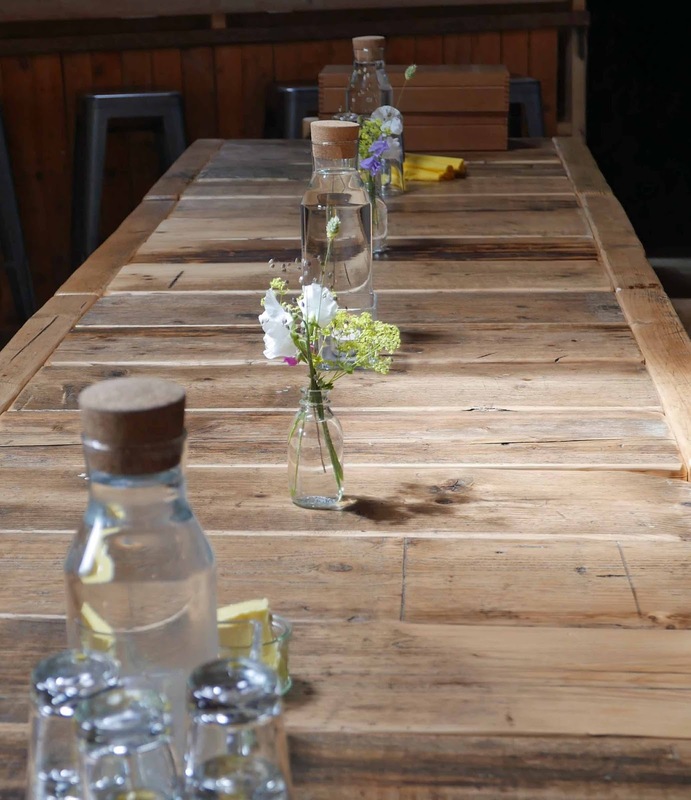 And, using the cheese, the smokehouse meats, and herbs, vegetables and leaves from her own garden just outside the dining room window, she put together a feast of Gubbeen. Nothing much to be added, though the organic wines from Le Caveau, the Gran Cedro Tempranillo and the Meyer-Fonné Pinot Blanc, were entirely appropriate and excellent matches. 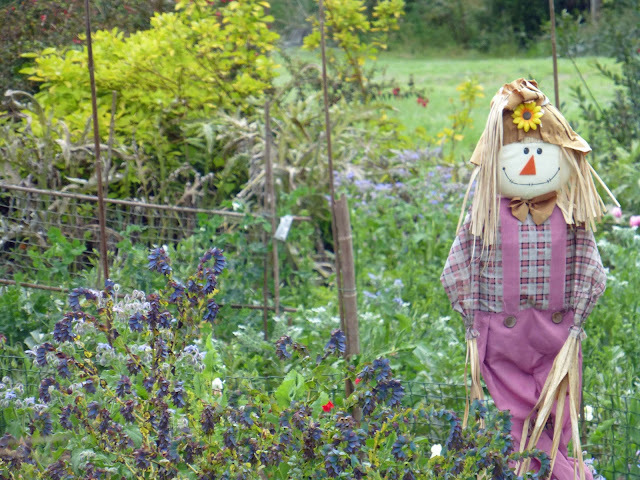 Her garden is completely chemical free with a strong emphasis on keeping the soil clean and healthy. Many of the herbs are used in the sausage recipes and meat cures. Gianna used the word dovetail earlier to describe how the different elements of Gubbeen have come together and the Gubbeen greens are becoming an increasing element of the great family story. Read all about them here. Budds Ballydehob for Lunch. Sandwiched between a couple of climbs! Two of the breeds here are originally Swiss. 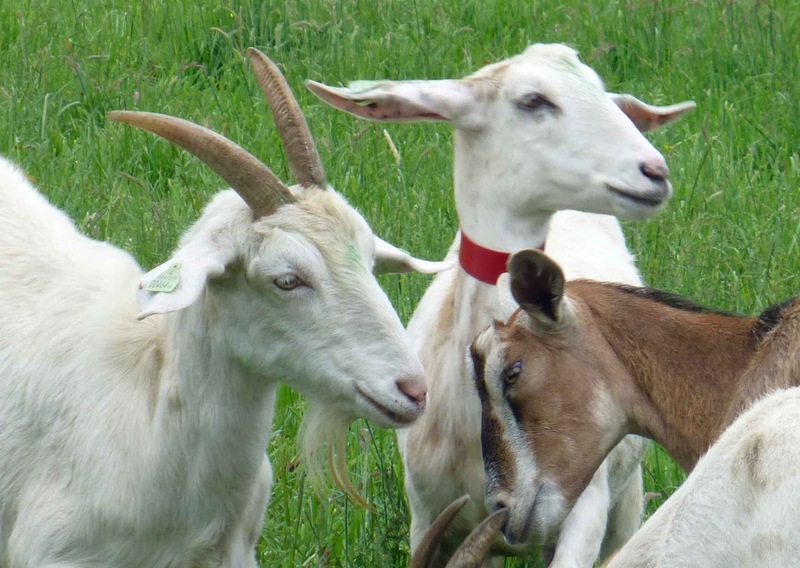 The Saanen goats are a white or cream-coloured goat breed, named for the Saanen valley in Switzerland. 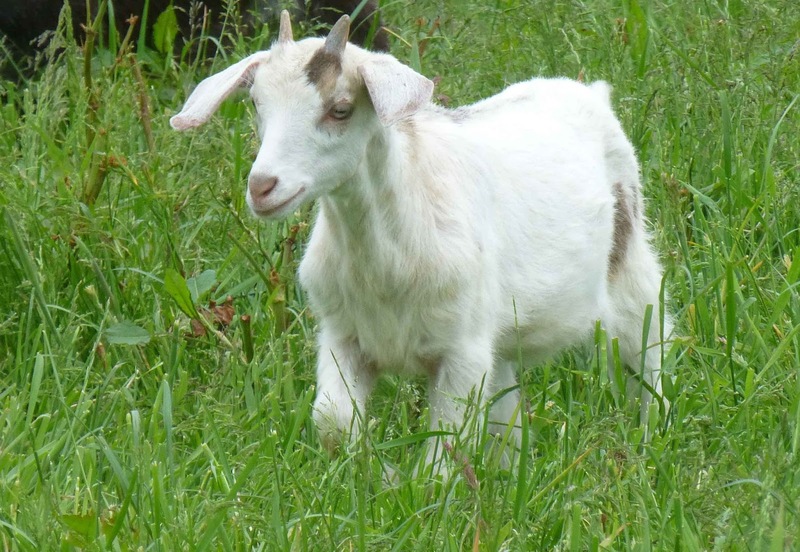 The Toggenburg goat, is a breed of milk goat, named after the region in Switzerland where the breed originated, the Toggenburg valley in the Canton of St. Gallen. 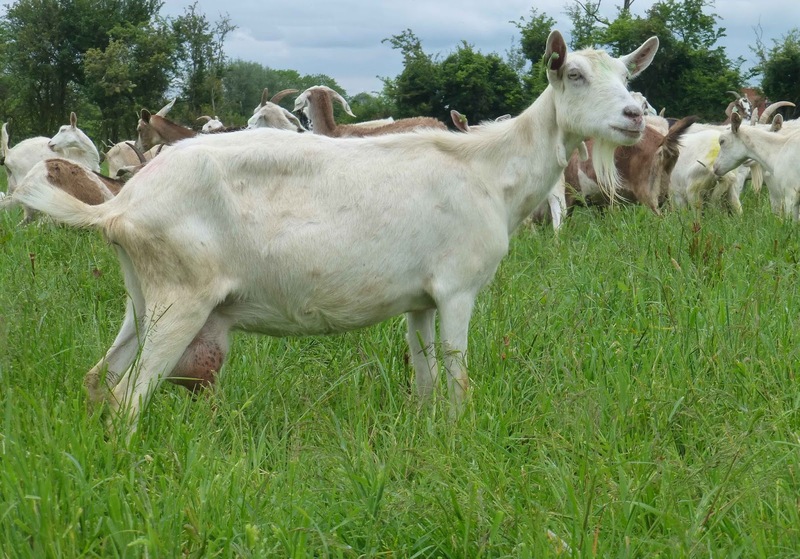 The British Alpine is a high-producer of quality goats' milk, and the breed can be found in many goat dairies. They’ve had goats here since the middle of the last decade and the herd was up to the 400 mark by 2007, the milk being sold on to dairies. They took the big step in 2013 when they bought out Bluebell Falls (then in County Clare). Breda and Victor did cheesemaking courses under Eddie O'Neill at Moorepark (near Fermoy) and, very importantly, Paul Keane of the original Bluebell gave them a solid grounding in the business over a three month period. By 2014, they were retailing their own cheese. And, continuing “the same system as Bluebell”, have expanded each year since and are proud of their BRC accreditation, the global standard for food safety. Their long oval packages have becoming well known to cheese lovers at markets, festivals and in the aisles of supermarket such as Dunnes and Tesco. Varieties such as the Original, the Honey and Garlic, the Cranberry, the Pepper, Mixed herbs and Garlic, and the Caramelised Onion and Caraway seeds, will be familiar to many of you. I met Victor at the recent Mallow Garden festival and he showed me the original and the cranberry in a newer different “tub” packaging. As tasty as ever but looking well. And right along them were the new products, not made from goats milk but from cows. Not any cows either. He uses gorgeous creamy milk from a herd of pedigree Jersey cows on a farm in nearby Dromcollogher. 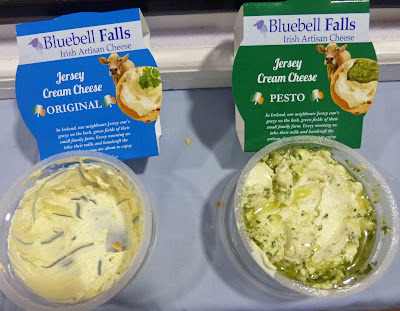 And the two new products, the Jersey Cream Cheese Original and the Jersey Cream Pesto are absolutely superb, well worth seeking out. After that chat, it was time to get out and do a bit of farm work. Victor took us through the long grass where a big group from the herd were grazing and soon, with the promise of food, we were surrounded. “How about giving a hand with the milking?” was the surprise question. Both of us put the hand up. Soon, he had a hold of one of the goats and CL was taking instructions, trying to concentrate and avoid the odd stray leg flying out. A second goat was more steady and the milk flowed, well flow may not be an exact description but she was getting the hang of it as I did later. Luckily, Victor doesn't have to rely on city visitors to do the milking of the large herd. He has a mechanical set-up that milks them twice daily. Then of course the cheese making starts. And when it is made, you must sell it. And that too takes time. Last weekend, Victor was at both the Mallow Festival and at The Sheridan's Irish Food Festival in Co. Meath. 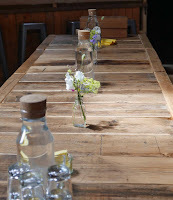 This week, it is five days at Bloom in Dublin, not counting the coming and the going. Tough going really but he gets great satisfaction from making a top class product and getting it out to the public. 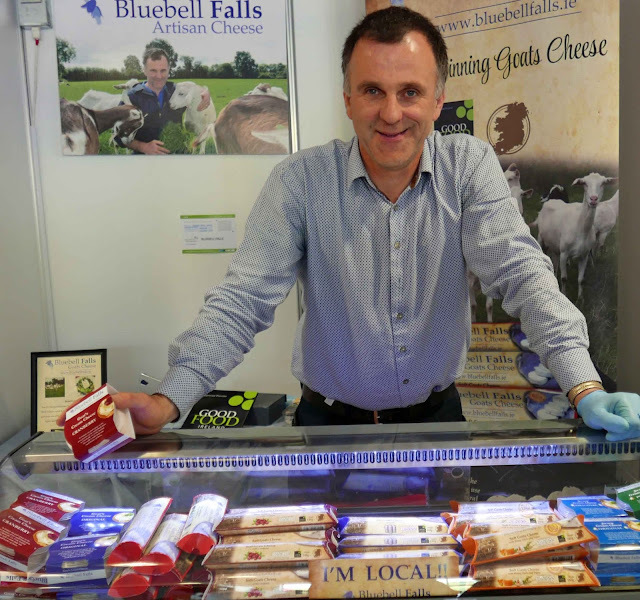 He is rightly proud of Bluebell Falls cheese and we consumers are lucky to have him on our Irish doorstep. Bluebell Falls is another reason why I'm happy to buy local! The multi-award winning soft cheese is supplied to top end hotels, restaurants and food service. It is distributed by, among others, Pallas Foods, La Rousse Foods, and Plassey Foods. Also available in all major retailers and good health stores. Ardsallagh Cranberry Roulade came tops in the New Cheese Section at the Irish Cheese Awards in 2011. It is still going strong and our Taste of the Week. It is a soft goats cheese with cranberry: 100% handmade, 100% natural, 100% local and 100% delicious, even on its own. Came across a striking way to use it during a meal in Jacques some time back when dessert was Medjool Date stuffed with Ardsallagh goats cheese, with Almonds and a full circle of Blood Orange. A gorgeous summer combination. 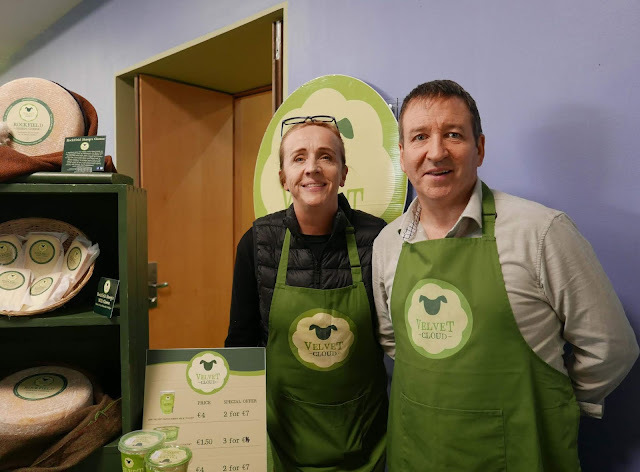 This small family run business in East Cork has grown steadily, and you can buy their products not only in local farmers markets, but also in national supermarket chains. I got mine at the Roughty Stall in Cork's English Market. Ardsallagh products can also be found on the menu of many well known restaurants across Ireland. The whole family contribute toward the smooth running of the farm and dairy. 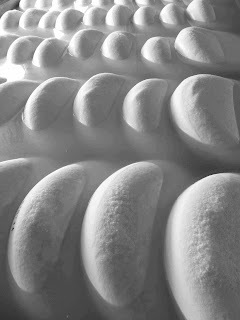 They use the ladle method, slowly and carefully, making a beautiful cheese that is easily digestible. 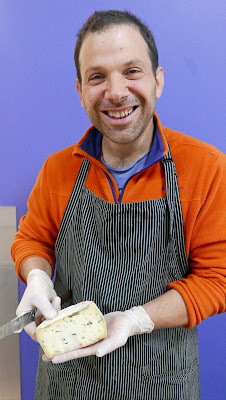 With Cork Cheese Week on (big weekend coming up at Cork Airport Hotel), thought you might like to read this 2016 post on Cheese and Beer, featuring Garrett Oliver, the renowned brewmaster at the Brooklyn Brewery. 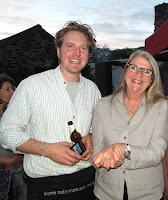 Garrett Oliver started a Ballymaloe LitFest talk and beer tasting, with this line. Soon, he would delve into bread and cheese, including fake bread and fake cheese. Garrett played a key role as the brewing/culinary pairing concept reached a critical turning point in 2003, according to the newly published Beer FAQ by Jeff Cioletti. That was the year that Garrett's book, The Brewmaster's Table: Discovering the Pleasures of Real Beer with Real Food, saw its first publication. He was also the editor of the Oxford Companion to Beer. 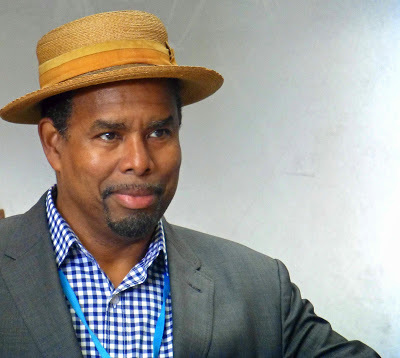 So it no surprise to see the dapper brewmaster at the Brooklyn Brewery listed as one of the 325 contributors to the just published Oxford Companion on Cheese. Yes, you read correctly. Three hundred and twenty five contributors! A few Irish among them, including Darina Allen (right) and Gianna Ferguson, Timothy P. Guinee (Teagasc), Alan Kelly (UCC), P.L.H McSweeney (UCC) and Colin Sage (UCC). But Oliver, tasked with pairing beer with cheese, is in his comfort zone. And, as in Ballymaloe, he first refers to the 20th century industrialisation of food and beverages “into nearly unrecognisable facsimiles of themselves” before craft began to restore “variety, subletly and life”. And so, in speaking of pairing, Garrett is talking craft and artisan. And he outlines the reasons why beer and cheese go so well together and, as always, he doesn't fail to boot wine down the list as a contender! In Ballymaloe, he said champagne comes in a beer bottle, not the other way round! In quite a hefty contribution, he goes through all the types of beer, from light ales to Imperial Stouts. You’ll have to get the book to see all the possibilities but let's have a look in the middle of the list under the heading Wheat Beers and Saisons. Brewer's Gold from Ireland's Little Milk Co. I presume some of you will remember the processed cheeses of our childhood, packaged in single serve portions, often foil-wrapped triangles. Names such as Calvita (the word apparently a mix of calcium and vitamin), Galtee, Whitethorn, come to mind. Well, the book reveals that the first such cheese (1921) was the French Laughing Cow. In the Basque country - Brebis with black cherry jam. At home in Ireland, I use loganberry jam. This book is huge and is very inclusive indeed with no less than 855 entries and claims to be the most comprehensive reference work on cheese available. It is well written, well edited and both the expert and professional will find something of value. But it is not the type of book I’d read from start to finish. It is one to dip into and that is what I’m doing here, just to give you a flavour. So if you want to look up kashkaval, you’ll find it is a hard cheese from the Balkans. Preveli is a semi-hard Croatian cheese. Want to get technical? Did you know that “stewing” is part of the process? That “stretching” refers to the traditional method of making Mozzarella? That “green cheese” refers not to a cheese that is green in colour but rather to a new, young, as-of-yet unaged, or underripe? 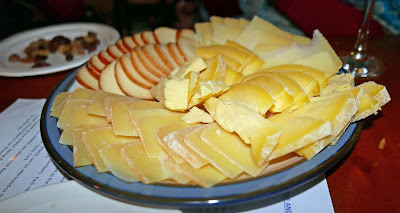 That the holes in Gouda or Edam are not called holes but “eyes”? And it is not just technical. There are many practical entries. Perhaps one that we could all read is under Home Cheese Care. Here you’ll read that the fridge may be bad for your cheese as it can be too cold for some aged styles. And there are quite a few entries on the history of cheese around the world, including the Americas. Indeed, the book is published in the US. Was it Irish monks that first brought cheesemaking skills to St Gallen in Switzerland? 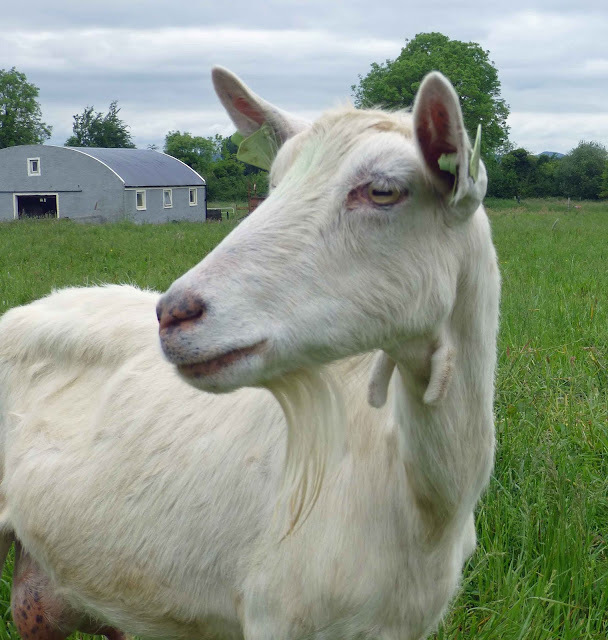 Nowadays, in a possible reverse, you can get a lovely St Gall from the Fermoy Natural Cheese Company. And how come it is only over the past forty years or so that Irish cheese is on the rise, Irish artisan cheese that is. In the Ireland entry, you read that by the 17th century, many distinctive aspects of Irish life and culture, including the Gaelic Farm economy and the native cheesemaking tradition, had been killed off by decades of oppressive English law. It took us an overly long time to recover! Cashel Blue, as far as I can see, is the one Irish cheese to get an entry to itself. Cheeses, most of them famous, from all over the world are highlighted, including from places such as Turkey and Iran. Hundreds of cheeses then but here are just a few of the better known ones that you may read about: Camembert, Chabichou, Cheshire, Gorgonzola, Gouda, Gruyere, Jack, Livarot, Mont d’Or, Ossau-iraty, Parmigiana Reggiani, Pecorino, Raclette, Reblochon, Stilton, Tomme, and Wensleydale. And, by the way, Garret Oliver didn't get the matching field to himself! There is also an entry on wine pairing by Tara Q. Thomas! The Oxford Companion to Cheese (December 2016), is edited by Catherine Donnelly, published by the Oxford University Press. Price: £40.00. * The book also lists cheese museums around the world. None in Ireland, yet!